In Greek mythology, Pegasus symbolizes the divine inspiration or the journey to heaven. Represented as a goodhearted and gentle creature, Pegasus appeared always eager to help and for his service, Zeus honored him with immortality by turning Pegasus into a star constellation on the last day of his life. 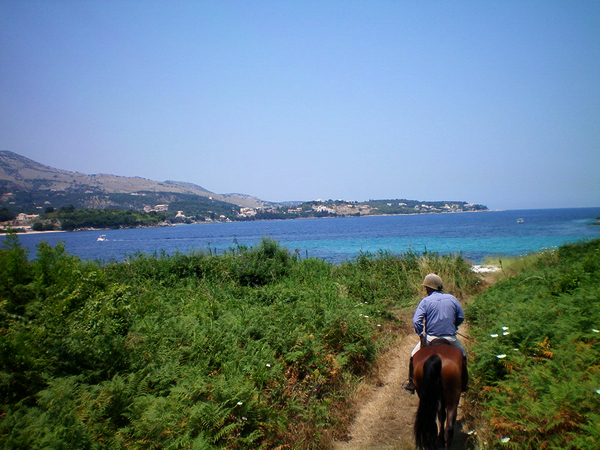 For all admirer of horses, we will be pleased to organize a horseriding tour through Corfu's unspoiled paths and and beaches on the beautiful peninsula between Kassiopi's little fishing harbour and Avlaki. Dimitris Horse Riding Center is located in Avlaki, only a few minutes by car from San Stefano. Dimitris' center works with rescued horses only that were previously neglected and abandoned. With love and the right training his horses have been given a second chance in life. One-hour tours in the morning and late afternoon are possible to arrange as well as four-hours horse riding tours for advanced horse riders. The tour goes among olive groves around Avlaki and includes breathtaking views of the Corfu's north-west coast and the Albanian mountains.